Democratic presidential hopeful and New York Senator Hillary Clinton gives an impromptu press conference at the Gala Cafe restaurant on Jan. 4, 2008. The scope of Barack Obama's victory in Iowa has shaken the Clinton machine down to its bolts. Donors are panicking. The campaign has been making a round of calls to reassure notoriously fickle "superdelegates"  elected officials and party regulars who are awarded convention spots by virtue of their titles and positions  who might be reconsidering their decisions to back the candidate who formerly looked like a sure winner. And internally, a round of recriminations is being aimed at her chief strategist, Mark Penn, as the representative of everything about her pseudo-incumbent campaign that has been too cautious, too arrogant, too conventional and too clueless as to how much the political landscape has shifted since the last Clinton reign. One adviser summed up the biggest challenge that faces the campaign in two words: "Fresh thinking." Specifically, those inside the campaign and outside advisers fault Penn for failing to see the Iowa defeat coming. They say he was assuring Clinton and her allies right up until the caucuses that they would win it. Says one: "He did not predict in any way, shape or form the tidal wave we saw." In particular, he had assured them that Clinton's support among women would carry her through. Yet she managed to win only 30% of the women's vote, while 35% of them went for Obama. A modest rise in Iowa turnout from traditional levels  say by about 20,000 or 30,000  might have been easy to write off as merely the result of superior tactics on the part of the well-funded Obama operation. But the fact that voters flooded the caucuses, and that Obama swept just about every demographic group, speaks to something larger that is going on in the electorate, Clinton strategists now acknowledge. That leaves them facing problems on two levels. The first, and easier one to grapple with, is how to deal with Obama. Even as the results in Iowa were still coming in, the Clinton campaign was mobilizing onto an attack footing. But it's possible that the most difficult problem is not Obama; it could be Clinton. How can she retool her message  and her identity as a virtual incumbent  to resonate with an electorate that seems to yearn more for change than any other quality? Says one longtime Democratic strategist, who is close to the Clintons: "Fundamentally, she is who she is; she can't change who she is, and maybe this is not her time." There are senior officials within the campaign  notably, outside advisers say, media consultant Mandy Grunwald and adviser Harold Ickes  who have been worried for months that Clinton was missing the fundamental shift in the electorate. However, their entreaties have gone nowhere. Bill and Hillary Clinton have put enormous faith in Penn, and given him veto power, aides say, over every word that goes into her television ads and every line in her mailers. "He had her and the President's trust very deeply," says one adviser who is close to the campaign. Adds another: "He's a one-man shop." If Clinton also loses New Hampshire to Obama, Penn's future with the campaign may well be in jeopardy, strategists say. But that may be wishful thinking on their part. For one thing, there is no obvious candidate to replace him. Hillary's advisers and Bill's have never gotten along  and she has been particularly suspicious of his team. 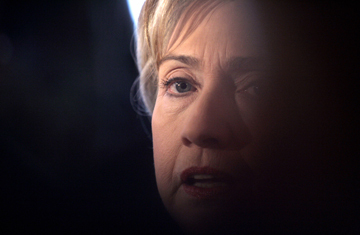 "Who they both trust  that's a very small group," says one former Clinton aide. "She is going to be very, very resistant to all of the white boys coming back." Another problem is that some of those who might potentially be brought in have already been sidelined. Former White House Chief of Staff John Podesta, for instance, is running a 527 organization called the Fund for America and is forbidden by law to even consult with the campaign. But everyone is aware that a victory by Obama in New Hampshire on Tuesday could accelerate a dynamic that could become very difficult to overcome as the campaign moves on. In South Carolina, which holds its primary on Jan. 26, half the Democratic electorate is African-American; though many have been wary of Obama's chances so far, that could change if he starts to pile up victories. Clinton might instead focus her attention on Nevada, which holds its caucus a week earlier, in hopes of snaring a victory there on presumably friendlier turf. But if Obama continues to gain strength  particularly in the face of attacks by Clinton's campaign  he undercuts her argument that she is the strongest and most electable candidate. And if he can stand up to the assault of the Clinton machine, it will also make him look more formidable against the Republican one.